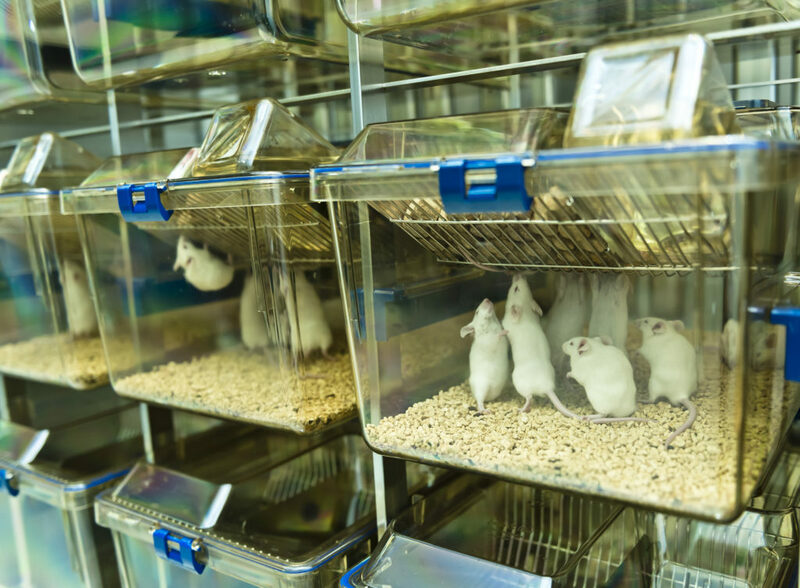 Despite decades of advancements in in vitro antibody production methods, many of the world’s largest diagnostics and reagents companies are still manufacturing in mice. The ascites method of manufacturing is inherently problematic due to batch inconsistency, supply chain unreliability, quality issues, and the ethics of using animals when alternatives are available. In this post, we’ll walk through the history of ascites manufacturing, why more and more companies are moving away from ascites, and how it can be effectively accomplished while minimizing risk to the product. Monoclonal antibodies (mAbs) revolutionized the diagnostic industry with their specificity and wide range of potential applications. Today, mAbs are used as tools for prevention, detection, and treatment of diseases. This diversity in mAb applications is due to the ability to design a mAb against almost any antigen – from molecules expressed by specific microorganisms to tissue-specific markers. mAbs can also be conjugated to a variety of proteins, small molecules, or radioactive markers to further expand their utility in the diagnostic and therapeutic spaces. The wide range of mAb applications is made possible by efficient mAb production methods. In 1975 Kohler and Milstein discovered how to produce mAbs using hybridoma technology in animals. Figure 1 shows the process of hybridoma creation by fusing single antibody producing B cells with immortalized myeloma cells and screening until there is a stable clone producing the antibody of interest. Figure 1. Mice are inoculated with an antigen/adjuvant combination to generate antibody producing B cells. These cells are then harvested from the spleen or lymph nodes and fused chemically with myeloma cells while centrifuging at high speed. Successfully fused cells are identified using a selection media and separated from one another through dilution. After clones are screened for their affinity to the target antigen, high producers are expanded for potential commercial use. In the ascites method of antibody production, a hybridoma cell line is injected into the abdomen of a mouse, where the cell line expands and causes a buildup of fluid in the peritoneal cavity called ascites. Fluid containing the antibody of interest can be collected over a series of draws ranging from 1mg-30mg per mouse, but more commonly 2mg-4mg depending on the hybridoma cell line (Peterson and Peavey, 1998; Jackson et al., 1996). Little has changed in the industry-standard production methods since the 1970s. Many large diagnostics companies still use mouse ascites as their production platform, often because it was grandfathered in with legacy products. The use of animals in research and manufacturing has been a point of discussion in the scientific community over the past twenty years concerning the use of animals in research and manufacturing. In 1997 the European Centre for the Validation of Alternative Methods (ECVAM) proposed a ban on the use of the ascites method in Europe based on the availability of alternative methods and the distress caused to the animals (Marx et al., 1997). Germany, the Netherlands, Austria, the UK, and Switzerland are among the EU states that have phased out all ascites production as a result. The U.S. has not been far behind. In 1997 the American Anti-Vivisection Society (AAVS) petitioned the NIH to prohibit the use of animals in the production of mAbs for many of the same reasons stated by ECVAM, namely that the invent of in vitro cell culture methods rendered the use of animals unnecessary (National Research Council, 1999). After some back-and-forth in the late 1990s, the NIH established the Committee on Methods of Producing Monoclonal Antibodies comprised of experts in relevant fields to launch an investigation. The NIH provides a few exceptions where mouse ascites methods may need to be used, but note that most production, especially for newly developed products, can be completed using in vitro technology. With advances in bioreactors and cell line development since the late 90s, this has only become more relevant. Despite the ethical implications and threatening regulatory shift, many companies have remained committed to mAb production in ascites. Transitioning to a new production method can be complex and difficult. Companies may already have established production facilities dedicated to ascites and don’t have the time or budget to validate new culture methods for a commercialized product. Many organizations are hesitant to take on the risk that their cell line may be one of the few that fails outside ascites. They don’t have sufficient capacity at their current facilities. Mouse facilities take up space and resources, especially when adding new product lines. Companies with multiple commercial products face bottlenecks when developing additional products or scaling-up their processes. Lack of in-house expertise regarding in vitro methods. A need for a greater regulatory level. Today, there are a multitude of in vitro technology options. Many products at small scales use shaker flasks or roller bottles. However, companies looking to manufacture around 1g or more per year may not get sufficient yields from a hybridoma cell line to justify the cost of traditional in vitro methods. Figure 2. Comparison of AcuSyst® Bioreactors and Ascites. 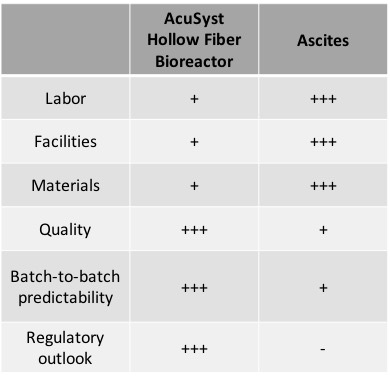 Labor, facilities use, and materials are higher for ascites than for AcuSyst bioreactors. Quality and predictability are better in AcuSyst instruments, and the regulatory outlook for ascites is poor. Hollow fiber bioreactors are ideal for transitioning away from ascites because they provide the most “in vivo-like” cell environment. Cell Culture Company’s (C3s) AcuSyst® hollow fiber perfusion bioreactors are some of the most efficient mAb production systems in the business. For production >1g, they provide marked improvements in cost, scale and time. The AcuSyst system achieves both low cost and high yield through the design of its hollow fiber cartridges. It needs 1/20th of the serum as a tank bioreactor and the smallest system can produce as much antibody as twenty roller bottles. The cells are continuously fed, allowing them to grow to tissue-like cell densities. These conditions result in generally improved titers, especially for low-producing cell lines like hybridomas. In three case studies with low performing cell lines, C3 was able to achieve a 5-fold increase in titer (Figure 3). This translates to lower cost of goods sold (CoGs) and faster production timelines. Figure 3. AcuSyst Bioreactors increase protein yield. 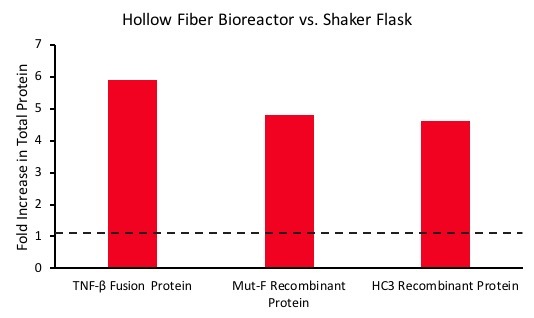 Three low-expressing cell lines were grown in shaker flasks and AcuSyst hollow fiber bioreactors. Data shown represents fold increase in total protein yield in AcuSyst bioreactors over shaker flask culture. Forecasting demand for a commercial diagnostic product is a difficult process prone to dramatic changes if development is too long. Manufacturing flexibility remains key; companies must be able to scale-up or -down depending on product needs. AcuSyst bioreactors are not only fully automated, but scale-up or -down with minimal effort by employing a “scale out” approach. This is especially relevant for manufacturing using hybridoma cell lines, as a major limitation of ascites is the loss of productivity at scale. If a single mouse can produce only 3-4 mg, then twenty-five mice would need to be tapped ten times each to generate just one gram of mAb. Commercial products also require a high degree of reproducibility as year after year the customers will demand the same product. Ascites methods can result not only in significant yield variability, but also may vary in product quality due to inconsistency in post translational modifications. AcuSyst bioreactors have been used for decades by leading diagnostic companies worldwide due to their flexibility. Many companies expect less than 15% lot-to-lot yield variability from year to year for their commercial products. For more information and to see the data, read C3’s case studies. C3 has over thirty years of experience working with hybridomas in AcuSyst bioreactors. If your company is looking to make the switch from ascites to in vitro, contact us here to start a conversation about how to transition to one of the most efficient mAb production systems in the industry. For more information on the AcuSyst and perfusion bioreactors, visit our instruments page. Evans, T. and R. Miller. 1988. Large-scale production of murine monoclonal antibodies using hollow fiber bioreactors. BioTechniques. 6: 762–767. Jackson, L. R., L. J. Trudel, J. G. Fox, et al. 1996. Evaluation of hollow fiber bioreactors as an alternative to murine ascites production for small scale monoclonal antibody production. J Immunol Meth., 189: 217–231. National Research Council (US) Committee on Methods of Producing Monoclonal Antibodies. 1999. Monoclonal antibody production. National Academies Press (US): Washington (DC). Peterson, N.C and J.E. Peavey. 1998. Comparison of in vitro monoclonal antibody production methods with an in vivo ascites production technique. Contemp. Top. Lab. Anim Sci., 37(5):61-66.